David and I have known Van online for years, and being a photographer herself, her and David knew eachother from meetups and photography events from years ago, and I had only known of her through her photography. Van booked us for her Mt. 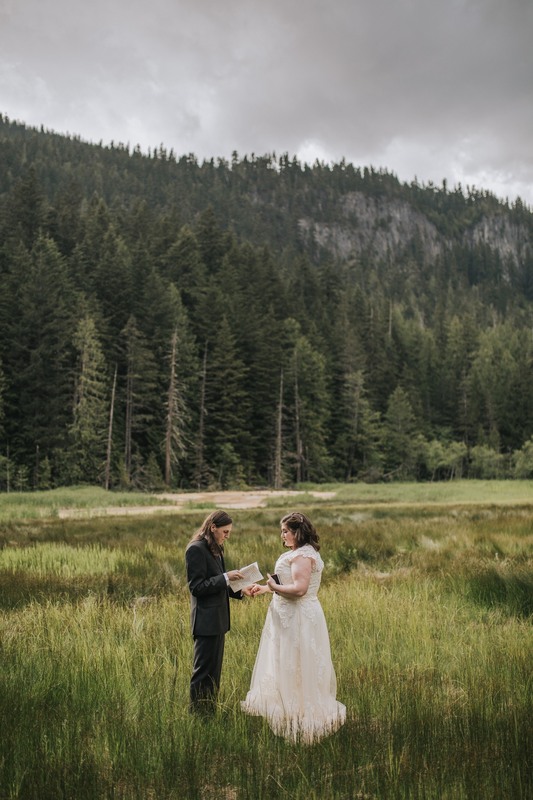 Rainier elopement last year and then her and Rob just made the move west to live in Tacoma. The day could not have been more perfect, it lightly sprinkled rain in the morning which kept all the tourists away and gave us so much of the park to ourselves. With a stunning bridge ceremony and a cloudy mountain, they exchanged their vows and had a lavender send off with their loved ones. Just as we made our way up the mountain for more bridal portraits, the clouds lifted off Rainier to the most epic and beautiful view we could have imagined. We were all giddy and blown away at the beauty of where we were, and how sacred these moments were for Van and Rob.